The core idea of Security Roller Shutters is to enhance physical security management of any facility along with preserving the building from external climatic conditions. These applications are the primary reasons why any company or household will readily opt for fixing the shutters. Not all shutters are the same as there are plenty of variants within the roller shutters that are classified based on the material used. Technology features also differentiate some of them to be advanced over the conventional options. The present day security roller shutters are completely automated and are made with materials resistant to stain and rusting effects. Such untoward impacts are not good for the longevity and outlook of your shutters. CompuGeeks, being the providers of comprehensive security solutions will be more than delighted to offer advanced physical security measures for your business and residential facilities. Even though the security measures are very important and can’t be compromised, one must be aware of the impact certain shutters have on the external look and feel of a facility. They are also supposed to be easy to operate so that the users are not troubled often. Considering all these aspects and keeping in mind the significance of physical security, we come out with options that are aptly suitable for every business. 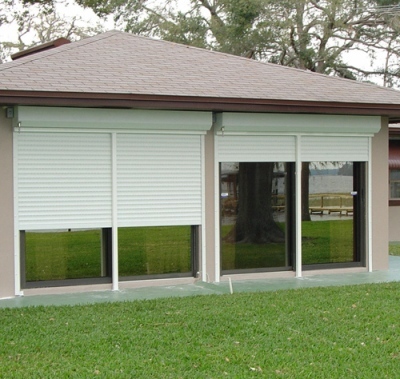 The key element of the modern roller shutters is related to automation or motorizing. The shutters that are meant for privacy as well as security enhancement need not be pulled down and lifted up physically like the old times. They can be operated with remote control mechanisms which makes them more suitable for residential facilities. The modern day security shutters are also intelligent in many ways, they are enabled with the backend technology to detect obstacles and provide frost protection along with offering tamper resistance. The shutters meant for security purposes can also be linked or integrated with the security alarms and sensor detection devises. They are pretty much part of an integrated security management system with a multi-purpose approach. At CompuGeeks, we are more than committed to facilitate all the key aspects of security management and maintenance of the essential systems. We always take a proactive approach to customize solutions so that every client has the opportunity to put forward specifications and preferences. Our trained and well oriented team of professionals is class apart in assessing your requirements and recommending options that are sustainable as well as economical.